The first in a stunning trilogy about the First World War, the novel takes a real life encounter between a doctor running a hospital for the wounded, and Siegfried Sassoon. 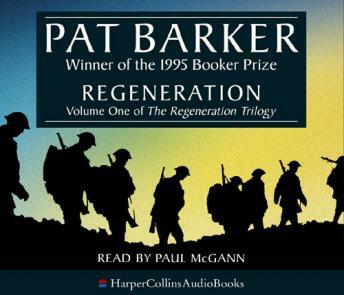 Craiglockhart, a hospital for officers ravaged by their experiences in trench warfare, is the setting for Pat Barker's 'Regeneration'. Here the poet Siegfried Sassoon, author of an article condemning the war, came under the care of psychiatrist W.H.R Rivers whose duty, as he saw it, was to return Sassoon to all the horrors of the Front, because Sassoon was sane, was healthy - and he had made a commitment. But while the encounter of Sassoon and Rivers is central to 'Regeneration', it is the exploration of the character of Rivers himself, the agony of the other patients and the insights into their minds, that makes this a tour-de-force. A superb novel related with chilling clarity and vivid compassion.